Sometime ago, while organizing all the minis, I have I noted that, of all the Valhallans I had, I was two short to fully fill out the units I wished to have. So I've been keeping my eye out for some on eBay. 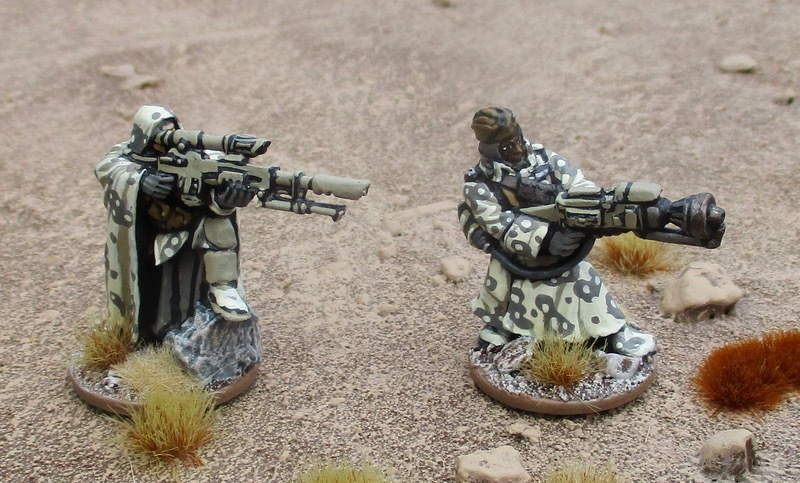 But buying individual miniatures just doesn't make sense - often sellers that are selling them want a ridiculous amount and, once you add in the shipping, It almost seems like a better deal just to buy a whole squad... but then where would that put me? A couple guys short of what I need to field complete units!? Why on earth did I paint up these two? Right now!? Well... they just arrived. Usually when miniatures arrive I prep and assemble and base and prime them all before storing them away in their drawers until I get to painting them... and so I did that with these... and there was just the two of them... and it's been a while since I painted any Valhallans... so I painted them. 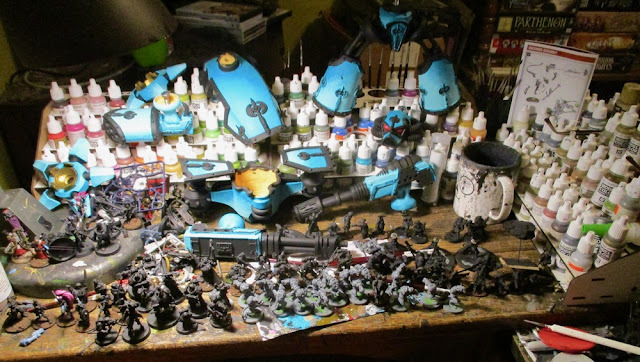 Even though neither of the two different units they will be going in has so much as a dash of paint (though they are all prepped, assembled, based, and primed!). It seemed like a good idea at the time and it was a nice break from all the other stuff I'm flailing at. 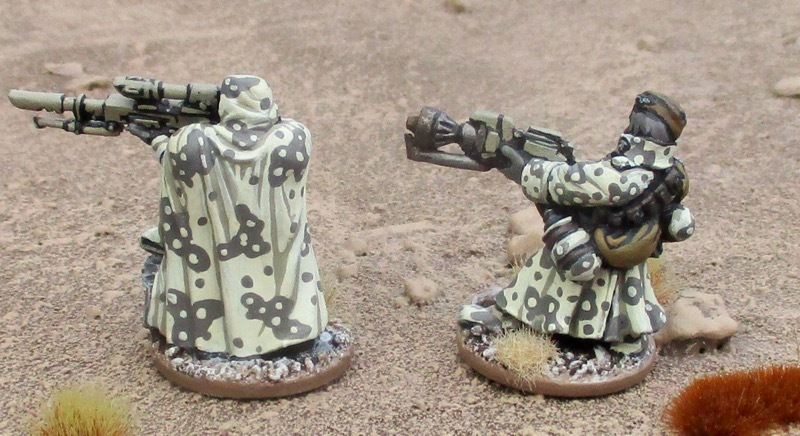 Sniper and Special Weapons Trooper. What I SHOULD be working on is stuff for the upcoming Kill Team campaign weekend - a little less than four weeks away! This would include John's Vermyn and a bunch of terrain. What I'm MOSTLY working on (when not painting silly things like Valhallans!) is the Reaver Titan... Now it is a bit of a priority - as I need it for the Apocalypse events just a couple weeks AFTER the Kill Team weekend. 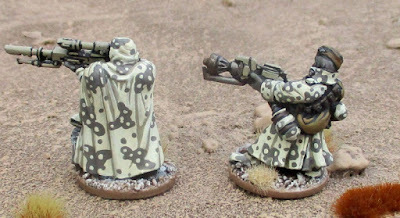 The Tallarn mortar Squad was a priority as it was my entry for this months painting contest for the Hunters of the Warp monthly painting challenge... AND I though I was going to need it for the Apocalypse event... but then when we decided to go ALL TITANS (and one Knight)... the motivation to complete then has gone right out the window. We been getting in a few games over the last few weeks. We've knocked SIX games off our 10x10 family boardgame challenge, I've knocked one game off my own personal challenge list - and we've got in a couple other games totally unrelated to any challenges! This past weekend alone we played Sentinels of the Multiverse on Friday (a challenge game), Saturday afternoon The Girl and I went over to some new friends to try out Scythe, later in the evening one of the kid's friends came over to continue their Dungeon Crawl Classics campaign while Amanda and I went out to play the first session in a Call of Cthulhu game my friend Bruce is running (with SEVEN players), and on Sunday evening we played Power Grid Deluxe (another Challenge Game). We're planning to knock a few challenge games off the list this coming Friday and Sunday evenings (not sure which ones just yet) and I'm heading out to my friend John's annual game day: Freezerburn. If I had to guess it'll probably be the Reaver Titan. Iv'e been working on some insignia I might add to all three. AFTER that the main priority will be John's Space Rats... then some more terrain... yeah.. time to go clear the rest off the table (at least temporarily) so I can get FOCUSED!!! Great job on the 2 Valhallans! Nice camo effect. Sometimes I also go ahead and paint new minis rather than ones that have been sitting around (whether still in packages or prepped and primed). Space rats, eh? I could probably use some for my sci-fi stuff - good foes for the forces of niceness. Yeah, the Space Rats (Vermyn from Mantic Games) are kind of fun. I'm actually just working on some background to fit them into the Xoxigar campaign. Love that camo! Is that a Bad Squiddo Ghost of Gaia Figure I see there!? Great looking figures, Tim. Love the camo work! Oh, that painting desk makes me nervous! All it would take is dropping a paint bottle or something like that and figures would go flying. Even if you drop it in the middle of the desk, you're risking the effect cascading and pushing minis off the desk like pennies perched in that arcade game. Maybe pull up Netflix and triage while binge watching "Tidying Up with Marie Kondo". As a gamer, I don't expect you to actually throw anything into the garbage though (we miniature gamers know that even strangest obscure thing can be re-purposed in some way). Think, if you truly want to paint something, it will make its way back onto the desk fairly quickly. Ha! I'm pretty careful around it - but yeah, once in a while I catch something and it hits the floor. Amanda won't let us get Netflix because she's afraid me and the kids will never leave the house if we did. Yeah, Netflix is a massive black hole of time. On the other hand, there's some useful shows that fit under the category of "Research". For example, I watched a Dutch movie called "The Resistance Banker", which is a true story set in WW2. What caught my eye was how very green the German soldiers uniforms were in the film. I have long known that the grey uniform was more greenish-grey than pure grey but these were more greyish-green. Congratulations on the "spring" clean on the desk though. Even though I'm not a naturally tidy person, even I appreciate the good feeling a clean will bring. We did sign up for the YouTube Prime (or whatever it's called) just for a month so we could watch Cobra Kai! "Busy" is a kind word for it. Lovely looking valhallans! Slightly scary desk,but if I'm being honest the table in my shed looks more than a little like it! More terrain but similar system!